Colder temperatures can signal the beginning of a sleepy time of year in the garden, as many plants are preparing themselves for several months of dormancy. These 10 cold-hardy succulents can handle low temperatures, many of them down to 0 and even minus 20 degrees Fahrenheit, meaning you don’t have to settle for a bare winter garden. 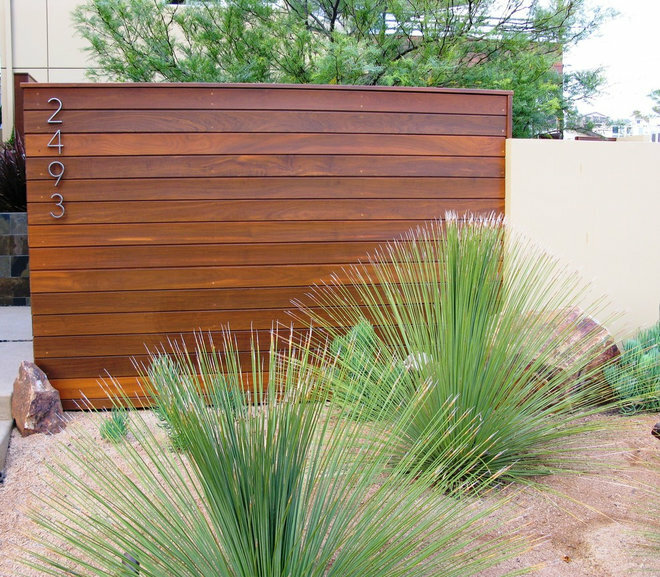 All of them look great year-round, but they especially shine in the cool season, adding texture and color to the typical evergreen landscape. 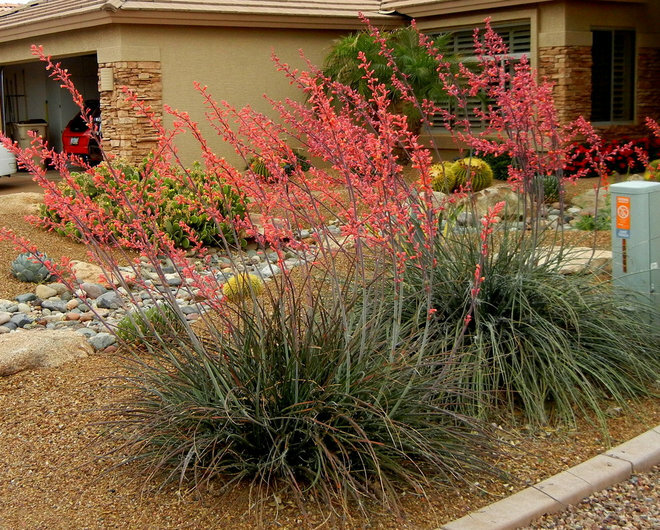 Red yucca’s succulent leaves mimic an ornamental grass by creating graceful mounds of evergreen foliage. Flowering occurs primarily throughout the spring and summer months. Five-foot-tall stalks with coral-colored flowers, attractive to hummingbirds, herald the arrival of warm weather. In addition to the more common coral color, there are varieties that produce creamy yellow and dark red flowers. Red yucca’s ability to thrive in full sun, whether planted in the ground or in containers, makes it a valuable addition to the landscape. Where it will grow: Hardy to minus 20 degrees Fahrenheit, or minus 29 degrees Celsius (USDA Zone 5; find your zone), depending on the species. Water requirement: Drought-tolerant once established; water deeply every three weeks in summer, monthly in spring and fall, and rely on natural rainfall in winter; in low-desert gardens, water twice a month spring through fall. Mature size: 3 to 4 feet wide and 3 feet tall (5 feet tall when in flower). 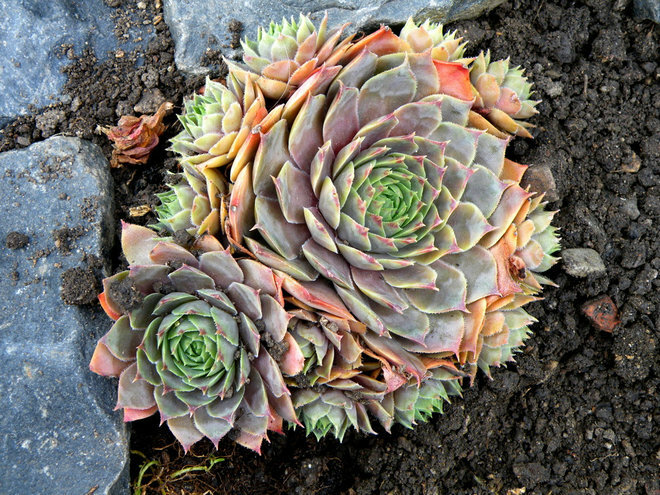 Hens and chicks, also known as houseleek, has legions of fans who love to watch the mother plant, or the “hen,” produce small baby plants, or “chicks.” There are as many as 50 species of Sempervivum and even more hybrids and cultivars, resulting in countless variations in color, shape and size. Typically used as a ground cover in rock gardens or tucked into the side of a stone wall, Sempervivum will grow with little attention. It’s also a popular container plant and can be brought indoors in areas that experience rainy winters, to protect it from getting too wet. As with most succulents, it should be grown in well-drained soil and watered only when the soil is completely dry. Remember that you’re more likely to kill a succulent by giving it too much water rather than too little. Where it will grow: Hardy to minus 30 degrees Fahrenheit, or minus 34 degrees Celsius (zones 4 to 9). 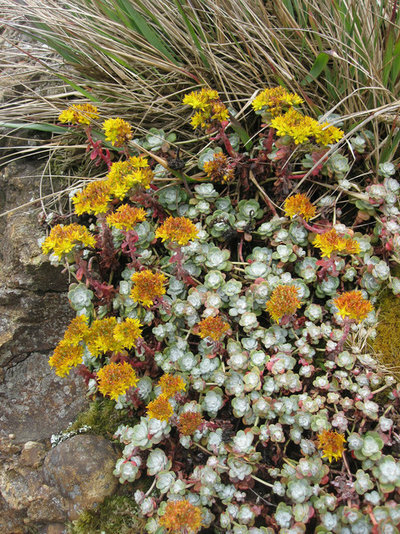 Mature size: Rosettes are ½ to 6 inches wide, depending on the species. The deep green leaves and spiky texture of Texas sotol, also called green desert spoon, add color to the often dormant and colorless winter landscape. 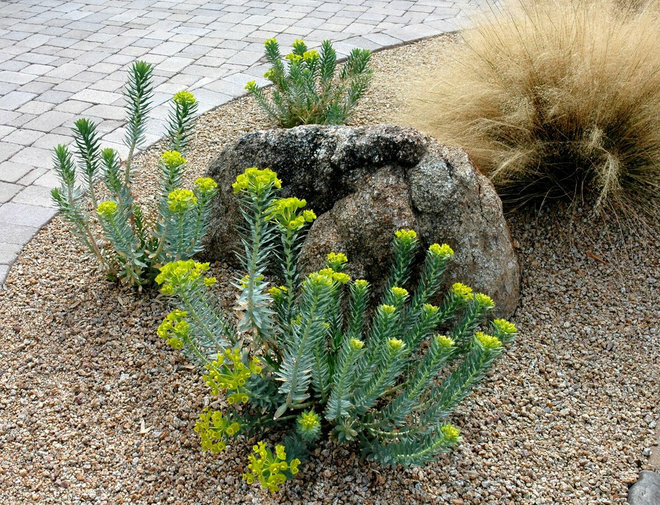 Its growth habit causes the leaves to fan out, creating a semi-spherical fan shape that brings interest to the drought-tolerant landscape throughout the year. A single flowering spike 10 to 15 feet tall may sometimes appear in summer on mature specimens; white flowers attractive to hummingbirds cover the spike. Where it will grow: Hardy to minus 20 degrees Fahrenheit, or minus 29 degrees Celsius (Zone 5). Mature size: 5 feet tall and wide. 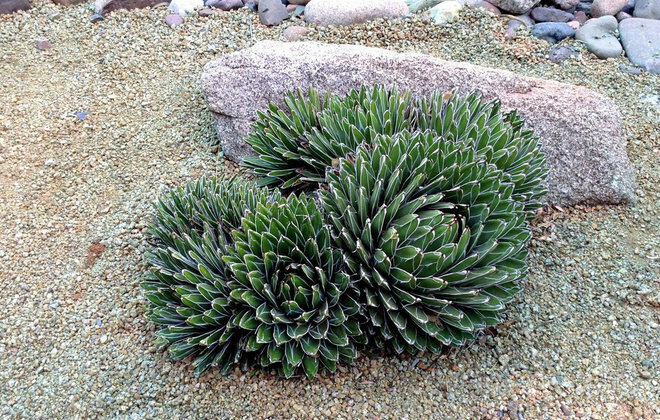 Parry’s agave comprises several varieties highly prized for their ornamental rosette pattern, which resembles an artichoke. Artichoke agave (Agave parryi var. truncata) is the most notable variety and is hardy to 10 degrees Fahrenheit, or minus 12 degrees Celsius; it has gray-blue leaves with contrasting maroon teeth. Other varieties of this small- to medium-sized agave include A. parryi var. couesii, which is hardy to 0 degrees Fahrenheit, or minus 18 degrees Celsius. A. parryi ssp. neomexicana is the most cold-hardy variety and can survive temperatures as low as minus 20 degrees Fahrenheit, or minus 29 degrees Celsius. These look great planted in groups of three and intermixed with smaller ornamental grasses such as blue grama (Bouteloua gracilis). 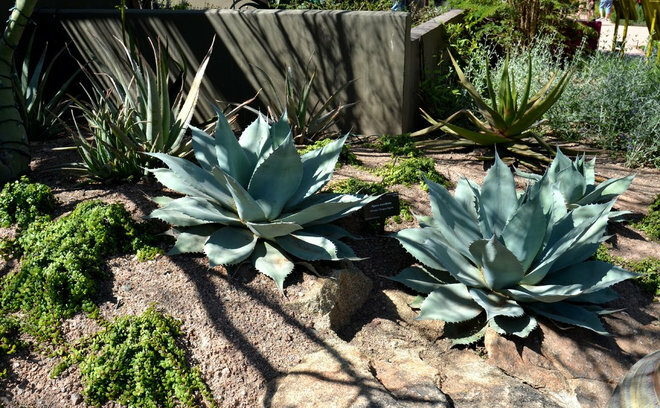 Parry’s agave can also make a statement on its own when planted next to a boulder. This agave makes a great container plant and can be brought indoors in areas that experience winter temperatures colder than the tolerances stated below. Where it will grow: Hardy from 10 degrees Fahrenheit, or minus 12 degrees Celsius, to minus 20 degrees Fahrenheit, or minus 29 degrees Celsius (zones 5 to 9), depending on the variety. Mature size: 1½ to 3 feet tall and wide. 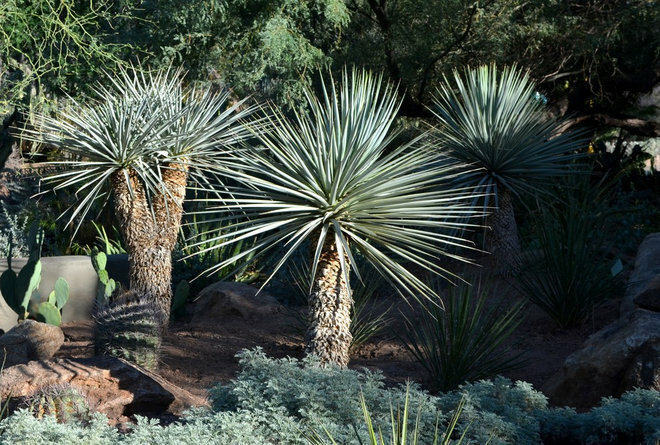 Thompson’s yucca, also called beaked yucca and Big Bend yucca, is an iconic, tree-like plant that stands sentinel throughout many natural areas of the Southwest and is equally at home in residential landscapes. Younger yucca plants grow as a single stem, while the older ones can branch at the top. The blue-gray leaves are arranged in a rosette pattern and occur on the top portion of the stem. As the 2-foot-long leaves age, they turn light tan and cover the stem, which can be left alone or pruned close for a decorative look. Clusters of white flowers appear in late spring. Where it will grow: Hardy to minus 20 degrees Fahrenheit, or minus 29 degrees Celsius (zones 5 to 9). Mature size: 10 feet tall and 3 feet wide. Where it will grow: Hardy to 0 degrees Fahrenheit, or minus 18 degrees Celsius (zones 7 to 9). Mature size: 2 feet tall and 3 feet wide. The sharp terminal spines can be clipped off to avoid being inadvertently pricked. Like all agave, this Mexican native will flower just before it dies. Mature size: 3 to 4 feet tall and wide. Where it will grow: Hardy to minus 5 degrees Fahrenheit, or minus 21 degrees Celsius (Zone 6). Mature size: 2 inches tall spreading to 24 inches wide. Many describe Queen Victoria agave as the most decorative agave species. Despite being less than 2 feet tall and wide, it makes quite an impression with its dark green leaves arranged in a tight rosette pattern and the stark contrast of its white leaf margins. The leaves curve inward and have smooth edges that end in a spine at the tip of each leaf. Plant next to boulders for a natural look or in rows for a contemporary design. This small agave also makes a great container plant and can be brought indoors during the winter in Zone 6 and below. Where it will grow: Hardy to 10 degrees Fahrenheit, or minus 12 degrees Celsius (zones 7 to 9). Mature size: Up to 18 inches tall and wide. 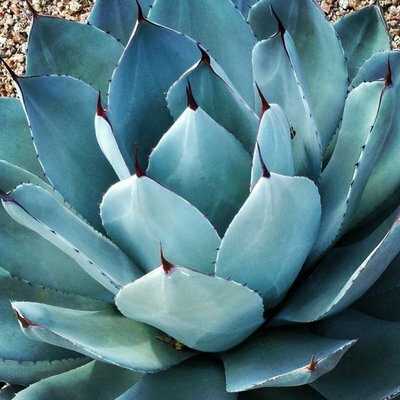 While most aloe species need relief from the hot afternoon sun, ‘Blue Elf’ aloe thrives in full sun, including areas that receive hot, reflected sun. 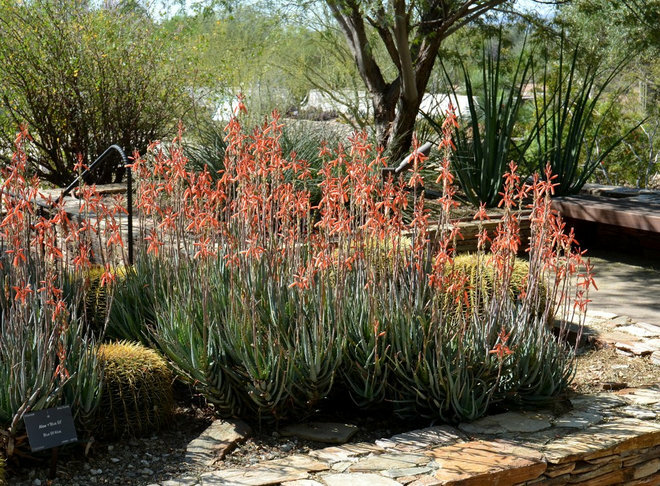 Combine its sun and heat tolerance with the beautiful orange flowers that appear in late winter into spring and it’s easy to see why ‘Blue Elf’ aloe is rapidly becoming a favorite in drought-tolerant gardens. The cold tolerance of this aloe is better than other aloe species, increasing the areas where it can be grown outdoors all year long. Plant in groups of three to five in raised beds or along pathways for greatest effect. ‘Blue Elf’ aloe also makes an attractive low-maintenance container plant that can be brought inside for winter in Zone 7 and below. Where it will grow: Hardy to 15 degrees Fahrenheit, or minus 9 degrees Celsius (Zone 8). Mature size: Up to 18 inches tall and 2 feet wide.